If your bathtub has seen better days, make sure you know your options before you break out the sledgehammer. Bathtubs and their surrounding walls are one of the most likely places you’ll find water damage. If you see cracked tile or failing grout or caulking, there’s almost certain to be water damage of some sort to the wall, the subfloor or even to your home’s structure. If you know your tub surround’s been leaking for a while, you should never just cover it up with a new tub wall and liner. Mold and mildew trapped behind the walls and floors can multiply and continue to damage your home’s structure and your family’s health even if you can’t see it. Serious mold eradication may require the help of a professional to be sure it’s completely gone before you renovate. 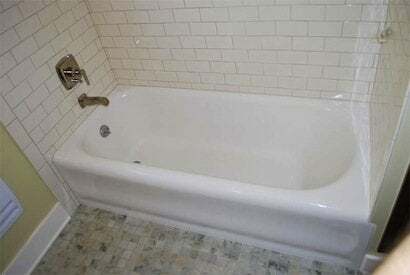 If you remove the old tile and substrate and find no water damage, you’re ready to consider your options for a new tub: top-of-the-line cast iron, or steel, acrylic or fiberglass.